Student debt crisis: Income share agreement a solution? Private equity titan Tony James, the executive vice chairman of The Blackstone Group, is taking on the student loan crisis by advocating for an alternative to traditional student loans. The 67-year-old investor is a supporter of something called an Income Share Agreement (ISA). Here's how it works: In exchange for an education, students agree to pay a set percentage of their income after graduation for a certain period. "Our thinking is to put a floor on it, so people who are low-income don't have to pay anything," James told Yahoo Finance. "The income percentage will be affordable for anyone. Even if you're just barely over the floor, it doesn't cost you much, and if you make a lot of money you pay a little bit more for your education, but you can afford it." James set up the Education Finance Institute and brought on Jim Runcie, the former COO of the Office of Federal Student Aid and a long-time investment banking veteran, as its executive director and president to explore how an ISA can be more widely adopted. More than 44 million Americans collectively owe about $1.5 trillion in student loans, making it the second most significant form of consumer debt behind mortgage loans. "I think it is a crisis," James said. "In fact, if you go back to the great financial crisis it was the one thing that we've made no progress on solving. The impact on lives is huge — students come out burdened with that. It gets worse and worse and worse. It's a big source of financial stress, emotional stress." 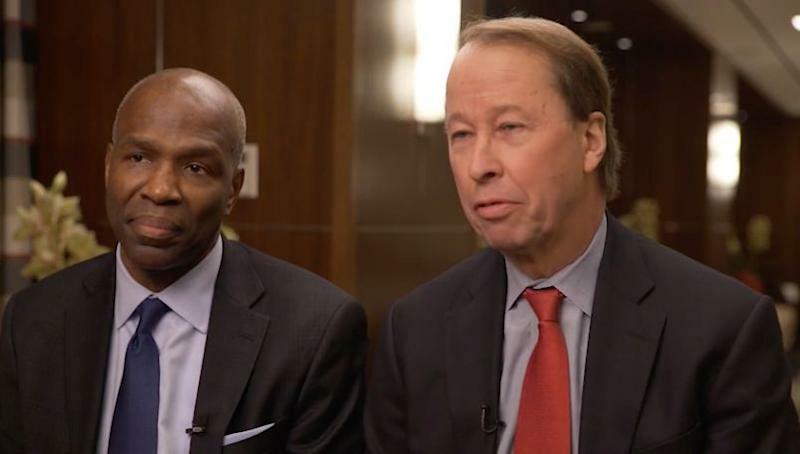 Jim Runcie (L), executive director of the Education Finance Institute, and Tony James, executive vice chairman of The Blackstone Group, support income share agreements as an alternative to traditional student loans. What's more, tuition, fees, room, and board for colleges has ballooned over the years. "[There's] no real alignment of interests. The colleges don't have a lot of incentive to keep the cost of education down, and that's one of the great things about ISAs," James said. "If you get a percentage of someone's income it will be determined by that person's income. This gives an alignment for colleges not only to keep costs reasonable but also the quality of education high so that people can go get jobs." One of the challenges the Education Finance Institute will face is addressing the stigma around the criticism that an ISA is a form of "indentured servitude." "[It's] actually the opposite — it's more liberating than it is anything else," Runcie said. "It allows you to be able to choose whatever job or career path that you want without being forced to pay some fixed level of payment. But, if someone decided they didn't want to work for a couple of years or decided to go to graduate school it doesn't accrue the interest, you don't capitalize it, so it doesn't grow." While ISAs aren't close to being mainstream, they do already exist. Purdue University was the first major university to start offering ISAs during the 2016-2017 academic year. The Purdue Research Foundation's "Back A Boiler" income share agreement program raised millions from institutions and wealthy individuals, along with a hedge fund and a family office. Andrew Hoyler, a 22-year-old airline pilot and a graduate of Purdue, used an ISA to fund part of his education. "I decided to give it a try because I knew how low the starting salaries of pilots could be," Hoyler said. "I wanted more breathing room and flexibility with my life the first few years after college since I was making so little. It provided a safety net." As a pilot for a regional airline, Hoyler pulls in around $36,000 per year, working out to be just under $2,000 per month after taxes. An out-of-state student in the aviation program, Hoyler used traditional loans to fund his education. Since graduation, he’s paid interest on those loans and hasn’t hit the original principal yet. An ISA won't accrue interest like a traditional loan, but it's likely that the student will pay back more than the initial amount borrowed. As Hoyler's pay increases over time, he realizes that he will likely hit the cap of 2.5 times the initial funding amount of $16,000, meaning he may pay back $40,000. That doesn't bother him, though. "It's worth the piece of mind for the first couple of years out of college not having to work two or three jobs to make minimum payments," he said.